The unique design allows the system to be set in a vertical or horizontal position, on bench-top or floor. You may purchase an optional caster base for portable use. Additionally, the System is available in two color choices- Black or White. Because of the exclusive modular design of our 987 Series, inlet covers are interchangeable. If you decide at a later date you would like a two-arm cover or downdraft cover, you can purchase those options at any time. Multiple Filter combinations are available to accommodate countless applications that require- Fume, Dust, Smoke, and Vapor removal. All of our filter media is manufactured according to top industry standards. We pride ourselves in our ability to accommodate a wide range of customers. Each System come standard with a Three Year Manufacturer Warranty and is designed, machined, and assembled in the United States. We constantly strive to meet our customers’ needs by developing unique new products. The unique design allows the system to be set in a vertical or horizontal position, on bench-top or floor. You may purchase an optional caster base for portable use. 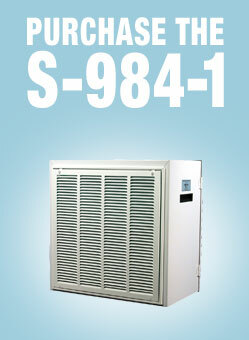 The S-987-2A is available in two color choices- Black or White. Because of the exclusive modular design of our 987 Series, inlet covers are interchangeable. If you decide at a later date you would like a single inlet or backdraft cover, you can purchase those options at any time. The Extract-All™ Model SP-400-DD Portable Air Cleaning System offers the utmost in versatility and high efficiency in a compact design. This Portable System is designed for direct source-capture removal of smoke, dust, fumes, and other airborne contaminants from a wide range of industrial and other applications. It features a 20” x 20” Grated Downdraft Cover and Removable 6” High Back and Side Shields for ease of use. This system is especially effective on welding and powder mixing applications. The SP-400-DD comes with a 4-stage filter pack which is appropriate for most smoke and dust applications. Additional filter options are available including HEPA filters for ultra-fine particulate and Refillable Adsorption modules for chemical vapor removal. All of our filter media is manufactured according to top industry standards. Each System come standard with a Three Year Manufacturer Warranty and is designed, machined, and assembled in the United States. We constantly strive to meet our customers’ needs by developing unique new products. We will continue to do so for decades to come. The Extract-All™ Model SP-400 Portable Air Cleaning System offers the utmost in versatility and high efficiency in a compact design. This Portable System is designed for direct source-capture removal of smoke, dust, fumes, and other airborne contaminants from a wide variety of industrial and other applications. It features a Self-Supporting 4” Diameter x 6’ Long Source Capture Arm for ease of use. This system is especially effective on welding and powder mixing applications. The SP-400 comes with a 4-stage filter pack which is appropriate for most smoke and dust applications. Additional filter options are available including HEPA filters for ultra-fine particulate and Refillable Adsorption modules for chemical vapor removal. We pride ourselves in our ability to accommodate a wide range of customers. Each System come standard with a Three Year Manufacturer Warranty and is designed, machined, and assembled in the United States. We constantly strive to meet our customers’ needs by developing unique new products. We will continue to do so for decades to come. The Extract-All™ Model SP-800-DA Portable Smoke, Dust, and Weld Fume Collector is designed for direct source capture of various airborne contaminants. 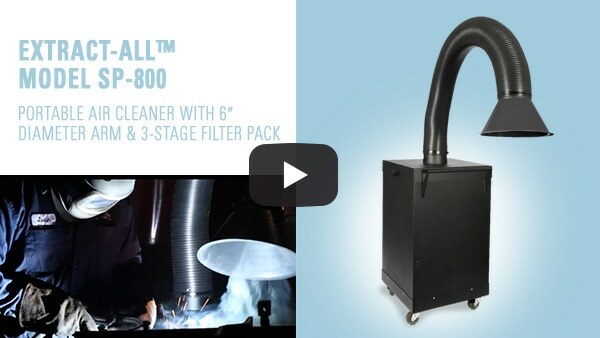 The SP-800-DA High Capacity Filter system effectively removes smoke, dust, fumes, and other airborne contaminants from a wide variety of industrial and other applications. The convenient Two-Arm design will allow you to accommodate two stations. It is an efficient and cost effective method of handling applications that require maximum portability. The system operates by collecting contaminated air through two 4” diameter by 6’ long Self-Supporting Extractor arms. The Extract-All™ Model SP-800-DA Portable Fume Extractor provides a Multi-Stage filtration system which includes a spark arrestor, Pleated Prefilter and a MERV 14 particulate filter for capture of harmful sub-micron particulate. Additional filter options are available including a HEPA filter and Vapor adsorbent filter media. Each System comes standard with a Three Year Manufacturer Warranty and is designed, machined, and assembled in the United States. We constantly strive to meet our customers’ needs by developing unique new products. It is estimated that over a half a million workers are exposed to hexavalent chromium in the United States alone. Workers in a variety of occupations are potentially exposed to this known carcinogen. Workplace exposures occur mainly from welding on stainless steel and other metals that contain chromium. Workers can inhale airborne hexavalent chromium as a dust, fume or mist. Breathing in high levels of hexavalent chromium can cause irritation to the nose and throat. Symptoms may include runny nose, sneezing, coughing, itching and a burning sensation. At Air Impurities Removal Systems, we pride ourselves in offering effective clean air solutions for our customers many needs. The Extract-All™ Model SP-800 Portable Air Cleaning System offers the utmost in versatility and high efficiency in a compact design. This Portable System is designed for direct source-capture removal of smoke, dust, fumes, and other airborne contaminants from a wide variety of industrial and other applications. It features a Self-Supporting 6” Diameter x 6’ Long Source Capture Arm for ease of use. This system is especially effective on welding and powder mixing applications. 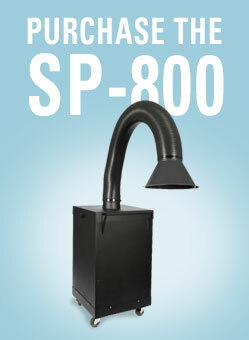 The SP-800 comes with a 3-stage filter pack, which is appropriate for most smoke and dust applications. Additional filter options are available including HEPA filters for Sub-Micron particulate and Refillable Adsorption modules for chemical vapor removal. We pride ourselves in our ability to accommodate a wide range of customers. Each system come standard with a Three Year Manufacturer Warranty and is designed, machined, and assembled in the United States. We constantly strive to meet our customers’ needs by developing unique new products. Many of these generate high levels of fine dust and toxic fumes. The Extract-All™ S-DTL-1 is a highly versatile Air Purification and Dust Collection System that allows the operator to collect fumes and dust directly from a single source or two side-by-side stations. The portable base system comes standard with a high efficiency primary filter and a polyester cube prefilter, which is ideal for precious material recovery. Our Extractor arms are made of a chemical and heat resistant material with flame retardant and abrasion resistant properties. The Unique design of our Extractor arms allows them to be manipulated in a variety of positions to allow for direct source capture. An optional slotted inlet cover with an acrylic hood, allows the operator to use the system as a downdraft surface. Our high performance motor blower offers quite operation unlike some of the dust collectors currently being used in today’s dental labs. • Quite Operation compared to standard dust collectors. Each System come standard with a Three Year Manufacturer Warranty and is designed, machined, and assembled in the United States. Air Impurities Removal Systems- Constantly striving to meet our customers’ needs by developing unique new products. The Extract-All™ Model DC-1000 Air Cleaning and Dust Collection System is a powerful yet compact system. Cartridge Filter. This separation combined with the compressed air cleaning mechanism drastically increases filter longevity. 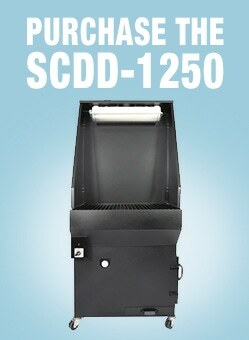 The Extract-All™ Model SCDD-1250 Downdraft Table is a Heavy-Duty and Powerful Air Cleaning and Dust Collection System. Keep a clean work environment while protecting worker health. Our high efficiency system works by drawing contaminants down and away from the operator’s breathing zone. Heavy Steel Grating Provides an excellent all-around work surface. Specialized materials are optional for plasma cutting, scratchless surfaces and non-sparking applications. Modular Design allows our tables to be used individually or in groups, side by side, or back to back, whatever best fits your requirements. If your requirements change, simply add another table or split up your existing ones. Available in 2’ x 3’ or 3’ x 4’ table sizes. Extract-All™ Brand Source Capture Fume Extraction Arms are designed for Commercial and Industrial environments where applications may produce airborne smoke, dust, mist, and fumes. Primary applications include Welding, Powder Mixing, and Solvent Fume Removal. Moving this arm up and down is easy, the hood swivels up to 360 degrees for precise positioning, and all units swing a full 180 degrees from left to right, when wall mounted. There is no need to disassemble the unit to adjust the arm tension. Simply turn the easily-accessible knobs to tighten or loosen the joints, so that the arm remains securely where you put it. Extract-All™ EA Snorkel Exhaust Arms and Blowers can accommodate single-station to multi-station set-ups. Precision Source Capture Arms along with Hi-Pressure Exhaust Blowers help reduce airborne Particulate and Fumes from countless applications. The Extract-All™ Model SC-1000 Portable Smoke, Dust, and Weld Fume Collector is designed for direct source capture of various airborne contaminants. The SC-1000 is ideal for cleaning most smoke, dust, and odors found in factories and other industrial and commercial facilities. It is an efficient and cost effective method of handling applications that require maximum portability. Extract-All Rigid Flex hose and flexible arms. This innovative design is self-supporting and made of heavy-duty, chemical-resistant, abrasion-resistant, and heat resistant polypropylene, with flame retardant characteristics. Unlike other brands that are designed with articulated joints or internal supports, Our Rigid Flex Hose has no joints or internal supports, this leads to maximum airflow. Extract-All Rigid Flex hose is available in various sizes, each of which can be manipulated to expand or decrease the intake diameter. This is accomplished simply by twisting the end to increase or decrease the diameter. If you would like to decrease the length of your Rigid Flex hose, simply unlock the hose by pulling the end tab. Snip off the appropriate amount, then snap lock it back into place. Extract-All’s amazing rigid flex hose offers highly effective clean air solutions for your laboratory and industrial applications. 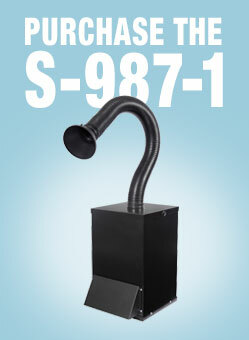 The SP-981-2B comes standard with Two Self-Supporting articulating extractor arms. Multiple Filter combinations are available to accommodate countless applications that require- Fume, Dust, Smoke, and Vapor removal. Optional third stage filtration may be used simultaneously with the standard two stage set up. All of our filter media is manufactured according to top industry standards. The Extract-All™ Model S-981-2B Bench-Top air cleaning system gives you a safer, healthier workplace by capturing air contaminants directly at the source and safely removing them before clean air is released into the room . Each unique air cleaning system is designed for Soldering, Lab Fumes and Dust, Cleaning with Solvents, and numerous other applications which cause airborne contaminants. The Extract-All™ Model S-981-2B Bench Mount System comes with two sets of mounting brackets to attach easily to table or bench-top, with the filter extending above or below. Multiple Filter combinations are available to accommodate countless applications that require- Fume, Dust, Smoke, and Vapor removal. All of our filter media is manufactured according to top industry standards. We pride ourselves on our ability to accommodate a wide range of customers. Each system comes standard with a three year manufacturer warranty, and is designed, machined, and assembled in the United States. We constantly strive to meet our customer’s needs by developing unique new products. When it comes to Machining operations, there are potential health hazards and risks associated with the oil-and water based cutting fluids that are used as coolants and lubricants. Metalworking applications such as cutting, sawing, polishing, and grinding along with the use of these cutting fluids produces a mist that is sent airborne. This mist can pose great health risks resulting from long term exposure. Facilities also are at risk of physical hazards to the worker such as slippery floors. Proper containment of floatation mist is essential to a safe working environment. Designed for direct source capture of various airborne contaminants, the Extract-All™ model E-300 Oil Mist /Smoke and Particulate Collector is an ideal method of cleaning unwanted nuisance or hazardous contaminants from the workplace efficiently and cost-effectively. The E-300 is most effective when accommodating a single machine or enclosure. 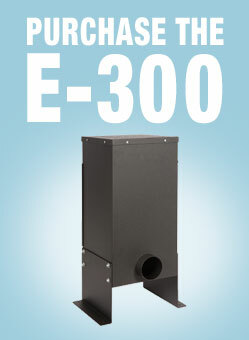 The E-300 operates by collecting the contaminant-laden airstream into the collector’s inlet plenum, which is designed to drop out large mist or other particles. The airstream then turns and passes up through a multi-stage filter system while the clean air is exhausted through the top of the unit. • Compact design suitable for various mounting configurations. • Cabinet is tightly sealed to avoid air bypass. • Standard liquid drain in bottom of unit. • Single-hinged door for easy filter removal and maintenance. • Low noise level during operation. • All CFM ratings are measured with clean filters installed. 1400, which can accommodate up to 4 machines. Our Extract-All™ model S-984-1 is ideal for countless applications. Our Unique System effectively removes airborne contaminants before they can escape into the workplace. This System is designed to act as a back-draft, self-contained filtration system. The Clean Air Station can also be used as a table-top spray booth. Add your choice of primary and final stage filter combinations and one of the three acrylic inlet capture hoods. Overheating and dirt accumulation can decrease the life expectancy of costly electrical and electronic components. Extend the life of electrical components by reducing maintenance down time. The Extract-All™ Model S-985 Filtering Enclosure Cooling Blower offers the utmost in versatility and high efficiency in a compact design, with a much higher level of filtration than standard muffin fans with mesh filters, while Far less bulky than air conditioners and compressed air coolers. The Extract-All™ Filtering Enclosure ventilator is a High performance method of cooling and filtering your electrical and electronic enclosures, while positively pressurizing them with ultra-clean air. Although designed primarily for electrical enclosures, the versatile filtering cabinet ventilator can be used to maintain other shop cabinets or enclosures.